Vietnam’s national dish has a mysterious magical appeal. The smell, the textures and the ritual of preparing a bowl of phở invades people’s dreams. 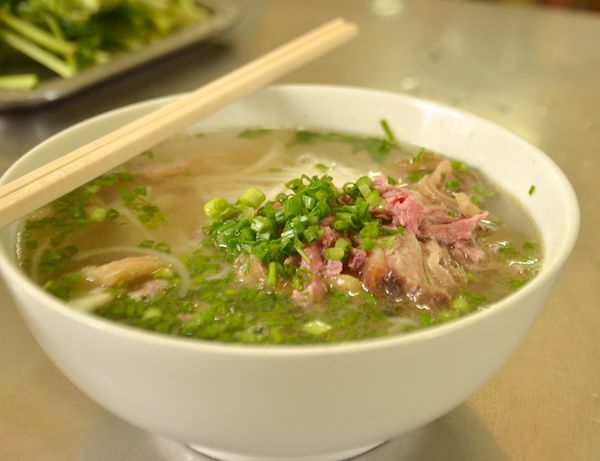 Perhaps that’s why it’s so popular for breakfast – if you’ve woken up with a phở yearning and you live in a place with a phở joint on just about every corner, why wouldn’t you have it straight away? But phở is not just a breakfast dish. It can be eaten for lunch or dinner or even as a between-meal snack. My phở experience begins even before I get to the restaurant. I love drawing in a deep breath of the star anise-scented stock as I near a phở place. I love looking at the phở-rapture on people’s faces as we squeeze through the busy restaurant to an empty table. 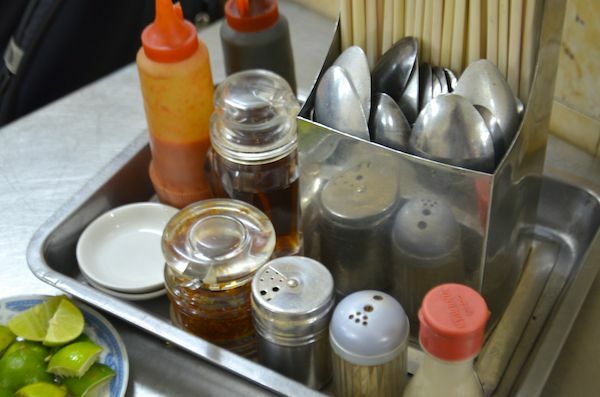 I love the metal tables and backless stools of a true local phở joint, the collection of sauces, chilli, pickles, pepper, chopsticks and spoons on the table, the little dishes of lime and sliced chilli and the basket of leaves. I love the shouts as our order is relayed to the cooking area, the loud pops as we smack open our wet towels and their cool kiss as we wipe our hands and faces in preparation for what’s to come. In less time than seems possible, steaming bowls are in front of us. I love how the noise of the restaurant and the street beyond recedes as we both slip into a zen-like state to squeeze lime into our bowls, rip herbs into bite-sized pieces and scatter them on the broth, transport chopstick-fulls of bean sprouts to our soup, then slices of chilli, then maybe some pickled garlic. A squeeze of sauce means our rituals are almost complete. The noise of other diners comes back as we lift and fold the hot noodles over our additions and Darling Man prepares a dipping bowl of black sauce and chilli. A few last mixing motions and then that first bite is conveyed through the air to a mouth that has been waiting far too long. Only after that first bite has been dealt with can conversation start. 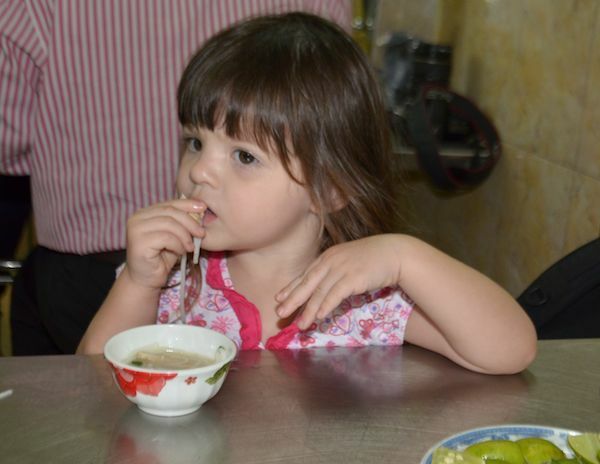 This is a true phở experience – a noisy restaurant, silky noodles, crunchy bean sprouts, tender meat and floating herbs. Visitors to Vietnam who play it safe and try phở at an air-conditioned phở chain or in a hotel restaurant are missing out on so much. Even many of those who venture out onto the streets aren’t getting the full experience. I’ve seen tourists start eating the soup without throwing in the extras or being too stingy with the amount of herbs used. 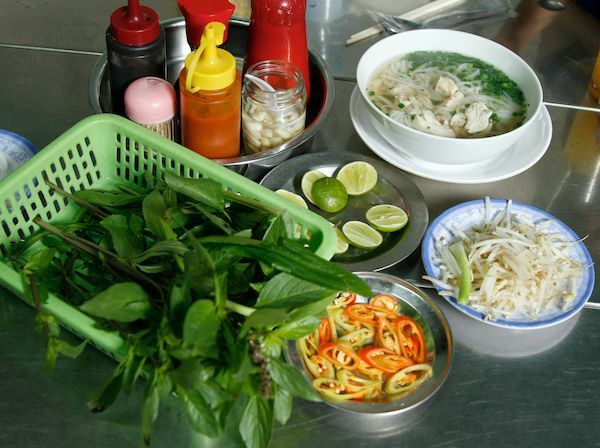 With this in mind, I’ve prepared a guide on how to eat pho (pronounced “fir” with a swooping questioning tone) so visitors to Vietnam can have the best phở experience possible. Ask for recommendations. If you’re a beef-eater (which I’m not), ask anyone with passable English where they like to eat phở and you’ll be set. 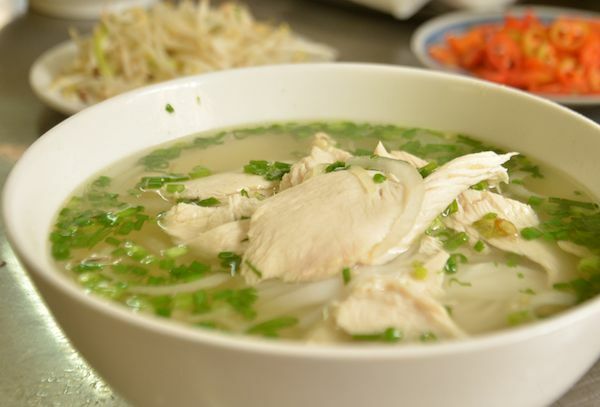 If, like me, you prefer phở gà (chicken phở), then ask about that specifically. 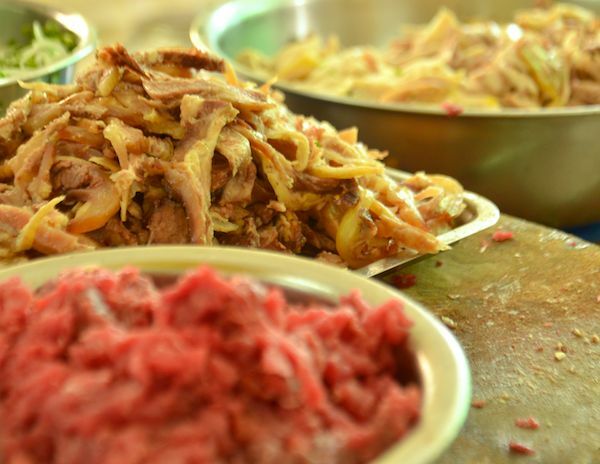 You will be heading to a place that only serves one or two dishes, so you have to make sure your dish is on the menu. Once you have a recommendation from your new best friend, ask them to write your order on a piece of paper, or write it yourself using the ordering guide below. I usually travel with Darling Man, who specifies my phở gà should not have any skin, fat, offal, bones or tendon, just lean chicken meat. Other phở variations can include various cuts of beef and even a side of raw egg. You can, of course, just point to what you want when you order. If you’d like to stir in a raw egg for extra protein, you can ask for một chiên trứng (a small bowl of egg). Survey what’s on your table and decide which enhancements you’re going to try. The condiments differ from restaurant to restaurant. I usually have a squirt of black sauce, called hoisin sauce for the technically minded. Darling Man sometimes adds a small squirt of chilli sauce to his phở. If there’s a stack of little dipping bowls on the table (and they’re not available everywhere) and you’ve decided you want to dip, prepare your dipping sauce now. A good long squirt of black sauce and a scoop or two of the dark chilli sauce, then give it all a bit of a mix. If you’ve ordered phở tái (raw beef), your meat will still be red when your bowl arrives at the table (obviously). The soup will cook the meat, so if you don’t like your beef rare, push the meat down into the soup. After organising your meat, squeeze one segment of lime into your bowl (for vitamin C), throw in some bean sprouts and then grab a handful of saw-tooth herb (the long leaves). Rip this into bite size pieces and throw it into the bowl. Do the saw-tooth herb first because it’s the toughest of the greens, so needs a little bit longer to cook. Then select a branch of herbs. Rip the leaves off one by one and throw them into your bowl. 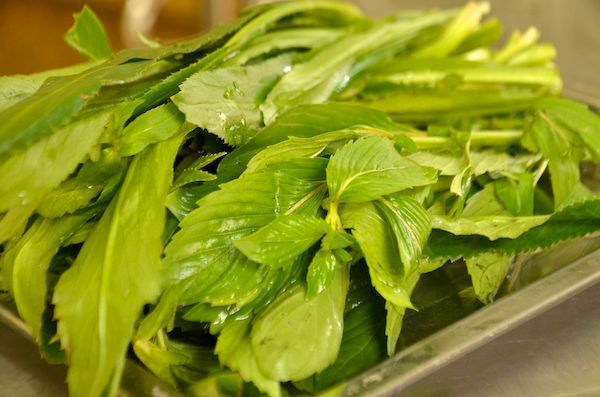 I usually use the leaves of one stem of the lemon-scented Vietnamese balm (it looks like basil but the leaves have serrated edges) and one or two stems of basil. 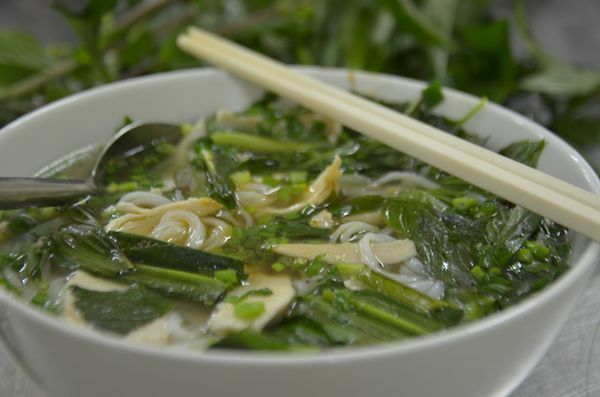 Rice paddy herb is often served with pho. This herb has a fat stem and small leaves and I think it’s too bitter for phở so I never use it. Now is the time to add chilli slices if you’re a hot chilli woman or hot chilli man. I usually add just one slice, and take it out again after a few minutes, leaving just enough heat to give my tongue a tingle but not enough to overpower the other flavours. Don’t be stingy with your phở herbs. Your bowl should look like this. If there’s pickled garlic, throw in a few bulbs. Phở is, after all, considered medicine as well as food, and garlic will add extra anti-bacterial properties to your bowl of hot steaming goodness. Add a squeeze of your desired sauce to your bowl. Not too much because you don’t want to overwhelm the delicate flavours of the broth. I use a little black sauce, which gives my phở a deeper colour and a richer caramel-y taste which I think works well with the star-anise in the stock. Almost there! It’s time to stir everything together, wilting the leaves and stirring in the sauce and distributing all the additions evenly through the soup. Select your first mouthful, blow on it to cool it and then convey it into your mouth. You can use the chopsticks to carry some meat or noodles to your mouth or you can use your chopsticks to load up a spoon (holding a spoon in your non-dominant hand can be awkward at first, but it is worth the effort to attempt this because you can experience all kinds of different phở flavour combinations). If you’ve prepared a dipping sauce, now is the time to dip. Enjoy! Remember that in Vietnam, slurping is OK and getting a bit messy is expected. You can reduce the messiness of your phở experience by leaning right over your bowl and shoveling and sucking simultaneously. 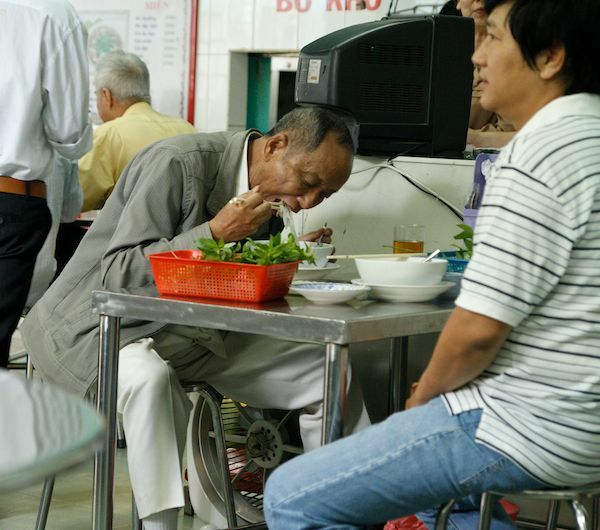 Vietnamese women somehow manage to eat phở more delicately than the men, loading up their spoons and serenely conveying it to their mouth without any drips or flips or slippery slide-offs. But foreigners are given special dispensation in the manners department, so just eat your phở whichever way suits you. All these steps will take less time than reading these instructions. Once you know what to do, the ripping, throwing, adding and mixing will be like second nature. So please don’t think eating phở is complicated. It’s not, it’s just heaps of fun, a create-your-own-adventure food. Try phở at Huong Binh, 148 Vo Thi Sau, District 3, Ho Chi Minh City. Yum! You’ve now made me crave a bowl of pho! I didn’t quite realize there were so many chicken varieties… I usually order beef myself but some of your photos of the pho ga just look too good. :Only after that first bite has been dealt with can conversation start.” Love it! You make it all sound incredibly delicious. Looking forward to trying this out if (when?) I ever visit Vietnam. Oh yum. thanks for the instructions. I am saving these for use next month. Can’t wait. oh.my.gosh. i need to eat pho, right now!!! thanks for the detailed instructions – and the translations, much appreciated!! hungry! Whenever Pete and I get back to North America, the first thing we do is scout out a good Vietnamese restaurant because it is our fave and we always miss it when abroad (although we both prefer Bun to Pho). 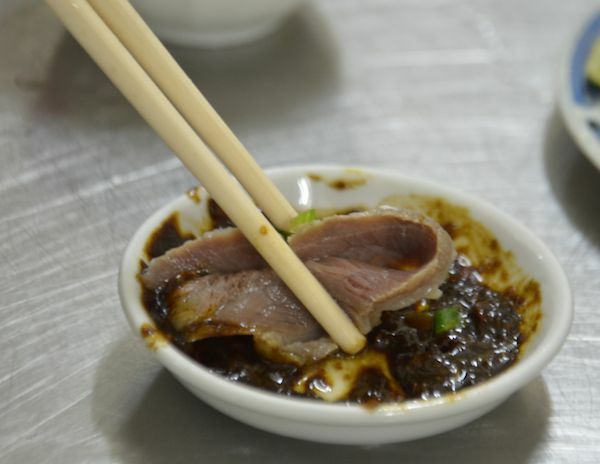 We have to get over to Vietnam and eat the real thing! Bun is pretty good too! But there is nothing like a bowl of hot steaming pho, is there? 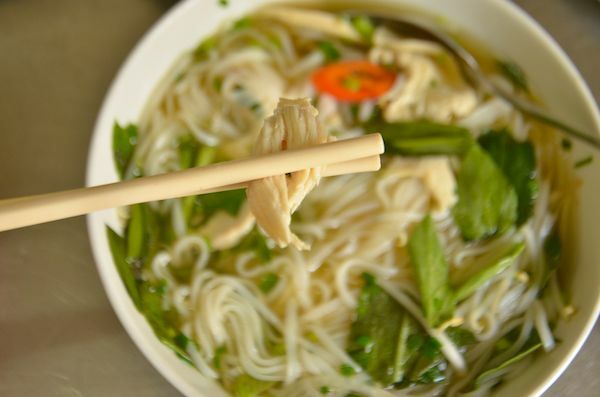 Wow – well written, great pictures, makes me want to try a big bowl of pho right now. Anyone have any recommendations for good pho in Minnesota? We’ve got a vibrant Vietnamese community here, but I wouldn’t know where to start. Thanks! All you need to do is find a Vietnamese person and ask them where they their pho. I found a great pho place in Melbourne when I lived there — LOVED it for lunch on a cold day. Probably the greatest export from Vietnam. Never been there, but I love this stuff. Thanks for the How To.